Bob’s Burgers, is about Bob Belcher, a second generation diner owner trying to get his business off the ground, and his family works with him because he needs the free labor. It’s not about the money with Bob, though. He uses as many flavors as possible to create unique burgers… The man is a food innovator who intentionally broke away from traditional diner food (like tuna melts) to pursue his dream menu, with a daily special every day. This morphed into the running joke of the series. According to the Bob’s Burgers Burger Book, the chalkboard gag evolved from a simple one-off where Louise changes the special to something crude into what the show does best: puns. But the burger of the week is more than just a pun gag. It’s an insight into the mind of Bob, who at first glance looks like any other grill cook in any other diner, except he *really* loves what he does. More than that, Bob’s burgers are supposed to be good. Really good. No matter how odd Bob himself might seem, he loves his creations. 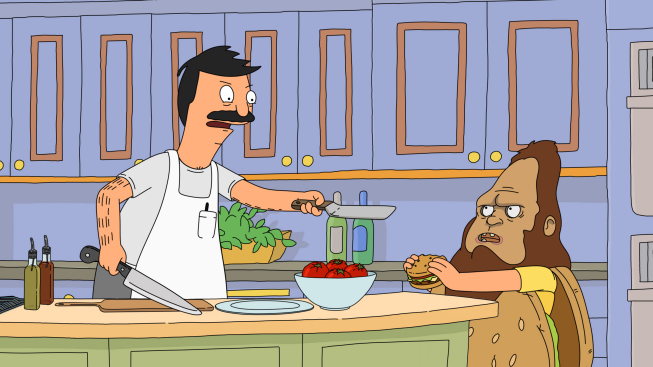 In Season 2, Episode 9 of Bob’s Burgers, Bob and his son Gene star a cooking segment for the local morning show “Get On Up,” where Bob cooks a burger and Gene becomes “Beefsquatch,” making fun of Bob in his new sasquatch mask and scarfing down the burgers. This eventually irked Bob to the point where they had it out on live TV and started a prank war. Normally, I would try to recreate what the burger of the day (behind the counter, not on “Get On Up”) was, but someone already did. The Bob’s Burger Experiment blog, made by an even bigger Bob’s Burgers fan, eventually publishing the Burger Book based on the blog. Bob doesn’t make the Poutine on the Ritz Burger on the show, but it is one of the specials in the diner in this episode and it is so good. While the burger itself isn’t topped with fries – they would turn into mushy, dry potato chunks (you hear me, Pittsburgh?) – The recipe includes enough gravy and cheese curds to come with a side of poutine! Separate a pound of ground beef into quarters and roll them into balls. The Burger Book suggests seasoning the beef, which I did. It was a great idea. Flatten the balls into patties and cook them in a flat skillet on medium heat. Using a skillet recreates the grill Bob uses and it keeps the fat in the burger. Be sure to toast the bun! The seasonings are for the fries. Cook the fries however you like, deep-fried or baking, as long as it gives them a crispy texture that will hold out against the gravy for a while. In the meantime, mix the spice together in a dish with a lid. When the fries are done, toss them in the spice mixture and cover evenly. Put a burger on one of the buns, then put the cheese curds on the burger. If you can’t find cheese curds (I had a hard time in Los Angeles), find a reasonable replacement… you want something slightly melty but without an overwhelming flavor. I liked fresh mozzarella or mild goat cheese crumbles. But really try for the cheese curds. It goes Bun, Burger, Curds, Gravy, Ritz, Bun. I added onion because I love onion. Take a handful of fries and add cheese curds to them as well. Cover both with gravy. Take a sleeve of Ritz crackers and crumble them up. Open the sleeve and add the Ritz crumbs to the burger. Top it off with the other bun. The Ritz crackers give an awesome crunchy texture to what would otherwise quickly turn into a mushy burger. The Bob’s Burgers Burger Book also gives great advice for seasoning meat, toasting buns, seasoning fries, and everything else involved in delicious burger production, literally everything you need to make Bob-level Burgers. Making burgers like a pro!